children attending will receive a surprise gift. is rated G for General Audiences and is 94 minutes in length. interest in her as does her leading man Ricardo (Ricardo Montalban. appear. Film is 107 minutes in length and is G rated. as Best Song. Film is G rated and is 88 minutes long. minutes in length and is rated G.
the family could experience the many disappointments he does each day. portrays his mother, and Ed Oxenbould appears in the role of Alexander. Film is rated G and is 8l minutes in length. Secret Love. Film is 01 minutes in length and is G rated. be shown in the Media Room of the former Corry Elementary School. Chairs with padded seats and backs are provided for Senior Citizens. welcome to attend. You do not need to bring children in order to attend. long and is rated G.
with music by Cole Porter. It was inspired by The Taming Of The Shrew. This Moment On, and Kiss Me Kate. It's G rated and 110 minutes long. been digitally remastered and is 92 minutes in length. 122 minutes long and is G rated. Family Night at the Movies will continue into 2015. 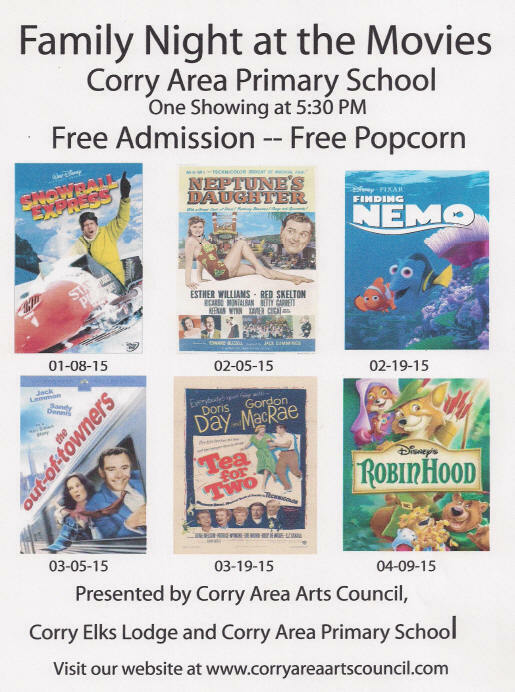 The event is being sponsored by Corry Area Arts Council, Inc, Corry Elks Lodge, and Corry Area Primary School. 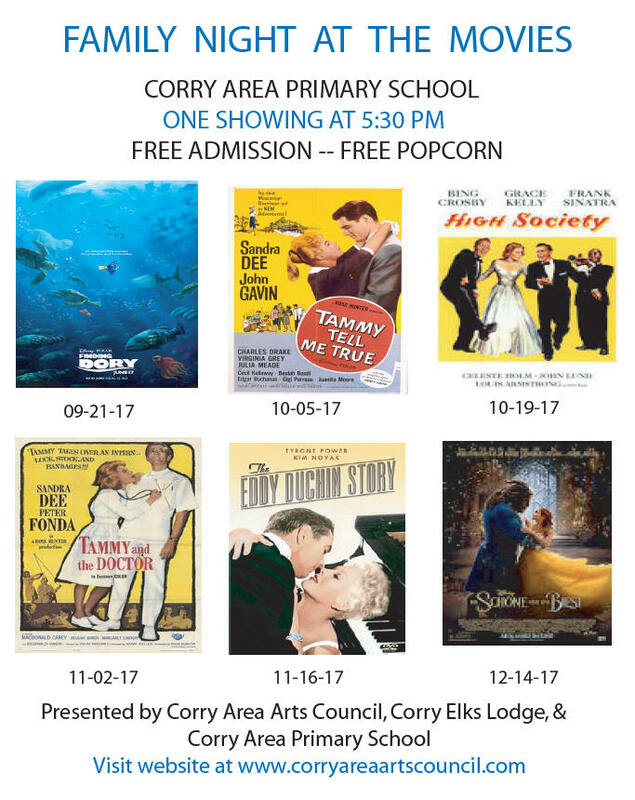 There will be one showing of each film at 5:30 PM on the designated dates in the Media Room at the former Corry Elementary School on Wright Street. Both admission and popcorn are free. All ages are welcome. The first of the six movies to be presented is Walt Disney's "Snowball Express" from 1972. This screwball comedy stars Dean Jones as Johnny Baxter, a man who quits his middle class job to run a Colorado hotel left to him by an uncle. Upon arriving he discovers that it is an immense ramshackle building with no heat and no tenants. Film is rated G for General Audiences and is 93 minutes in length. MGM's "Neptune's Daughter" from 1949 is the second in the series. This Technicolor musical comedy stars Esther Williams, Red Skelton, Ricardo Montalban, and Betty Garrett and features water ballets, swimming sequences, and polo playing. It also includes the Academy Award Winning Song, "Baby, It's Cold Outside". Film is 95 minutes long and is G Rated. The third of the six movies is Walt Disney's "Finding Nemo" from 2003. This computer animated comedy adventure tells the story of Marlin, an overprotective clownfish who is searching for his kidnapped son Nemo with the help of Dory, a regal tang fish. Film won the Oscar as Best Animated Feature of the year and was also nominated in 3 other categories. Film is 100 minutes in length and is rated G.
Paramount's "Out of Towners" from 1970 is the fourth movie in the series. Based on the hit play by Neil Simon, the film tells the story of George and Gwen Kellerman (Jack Lemon and Sandy Dennis) a young couple from a small town in Ohio who travel to the Big Apple when George is summoned there for a job interview. Their misadventures in New York City prove to be a laugh riot. Film is rated G and is 96 minutes long. The fifth of the six movies in this series is "Tea For Two" the Warner Brother's hit musical from 1950. Wealthy Nannette (Doris Day) bets her uncle that she can say "No" to every questioned asked her for 48 hours. If she can accomplish this feet, her uncle will give her $25,000 to help finance her boyfriend Jimmy's (Gordon MacCrae) new play. Songs include "I Know That You Know", "Crazy Rhythm", "I Only Have Eyes For You", "Tea For Two", and "I Want To Be Happy". Film is G rated and is 98 minutes in length. Walt Disney's animated feature from 1973, "Robin Hood" is the sixth and final film in this series. It is based on the legend of Robin Hood who robs from the rich to give to the poor. This time the inhabitants of Sherwood Forest are all animals instead of people. 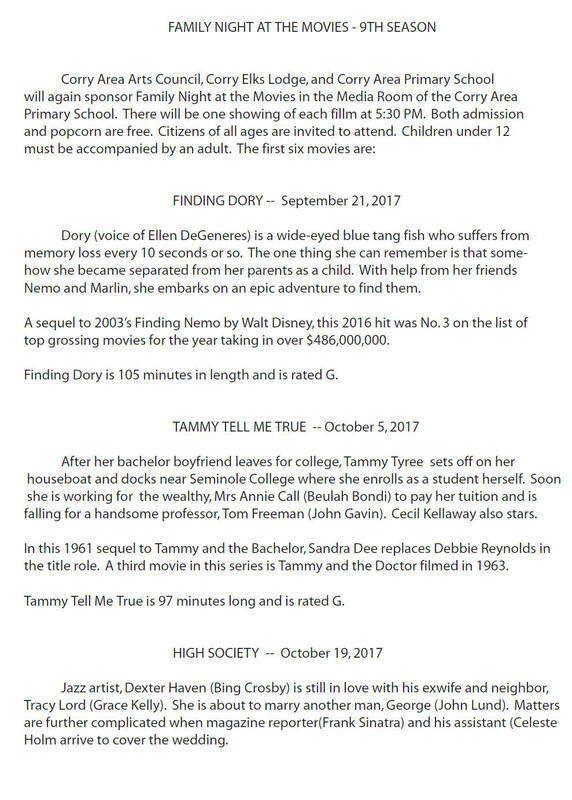 Film is 83 minutes in length and is rated G.
Family Night at the Movies will again be held this school year. 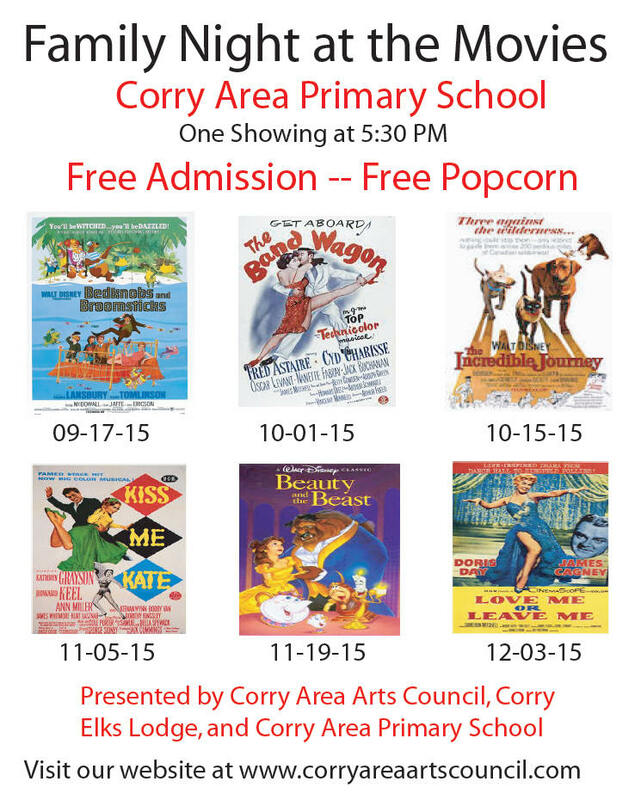 The event is sponsored by Corry Area Arts Council, Inc., Corry Area Primary School, and Corry Elk's Lodge. 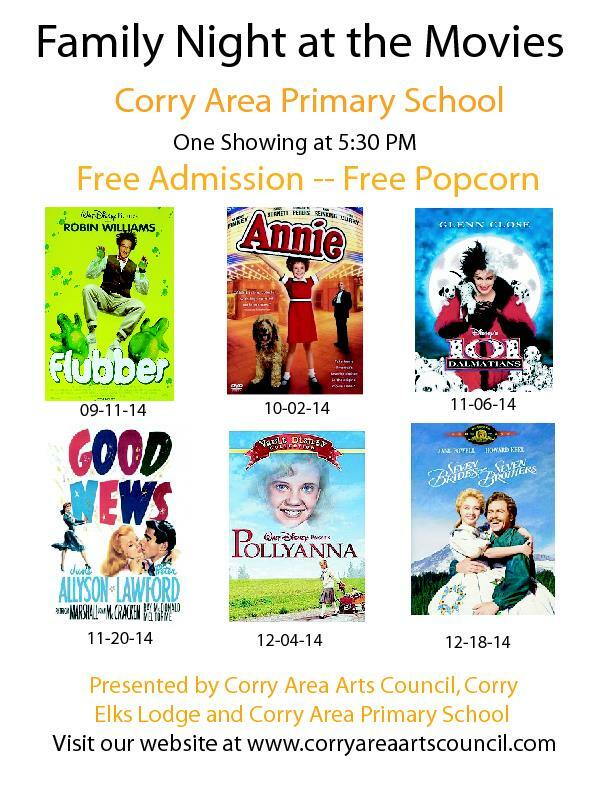 There will be one showing at 5:30 PM in the Media Room of the former Corry Elementary School. Both admission and popcorn are free. Everyone is welcome. hilarity, Disney's all-time classic puppy tale tells the story of Dalmatians Pongo and Perdy and their human pets Roger and Anita (Jeff Daniels and Joely Richardson) who are overjoyed by the arrival of their 15 puppies. Soon the puppies along with every other Dalmatian puppy in London are kidnapped by Cruella and her henchmen and it takes all of the town's animals working together to rescue them. This movie is 103 minutes in length, has been digitally remastered, and is G rated. "Lucky in Love", the Oscar nominated hit "Pass That Peace Pipe" and "Varsity Drag". The film is 93 minutes in length and is G rated. The fifth of six movies presented this fall at Family Night at the Movies will be Walt Disney's 1960 classic tale, "Pollyanna". Hayley Mills received a Special Academy Award for Outstanding Juvenile Performance in this timeless tapestry of small town Americana. Pollyanna brings sunshine into the lives of everyone she meets. Her Aunt Polly (Jane Wyman) is too concerned with appearances, propriety, and local politics to appreciate her effervescent niece. It isn't until the town almost loses their "Glad Girl" that Aunt Polly realizes the power of love and lightheartedness. Film is 134 minutes in length, has been digitally remastered, and is G rated. comes home with Millie (Jane Powell). Upon returning to the homestead she discovers that he has six other brothers who soon want wives too. The film is based on Stephen Vincent Benet's "Sobbin' Women". Containing some of the best dance sequences ever, the film was nominated for 5 Academy Awards including Picture, Screenplay, Cinematography, Editing and Scoring of a Musical. Songs include "Bless Your Beautiful Hide", Goin' Courtin'", "Lonesome Polecat", "Spring, Spring, Spring", and "Wonderful Day". Movie is rated G and is 102 minutes in length. 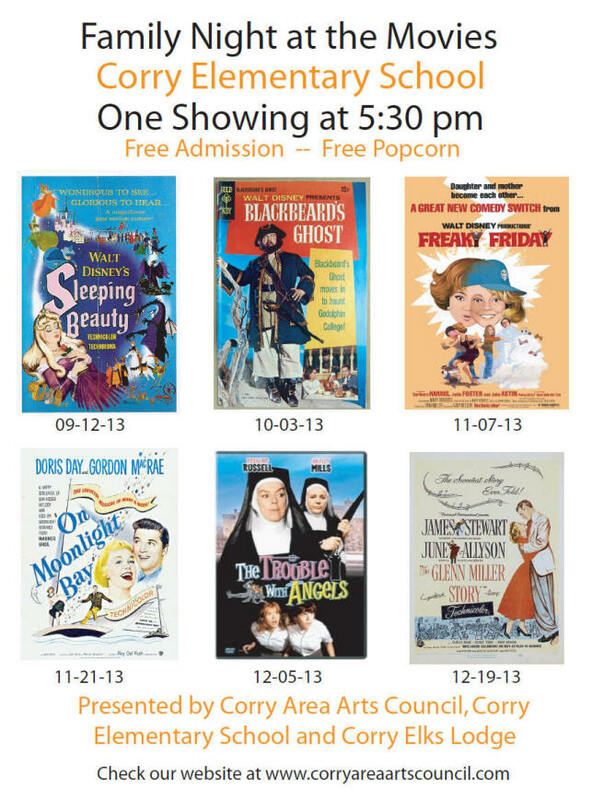 Thursday Night at the Movies kicks off 2014 with free showings of family-oriented films and free popcorn. 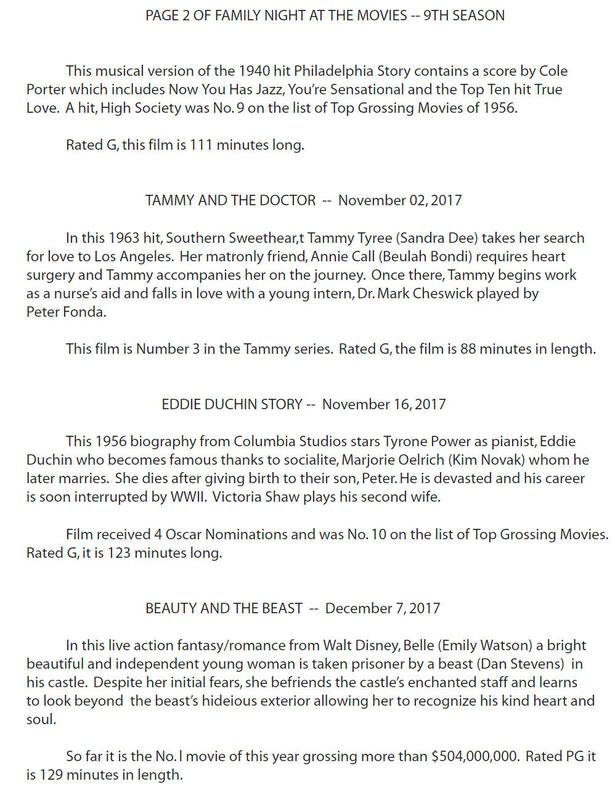 The popular Thursday Night at the Movies series will continue in January 2014 with 8 movies scheduled for showing during the next 4 months. 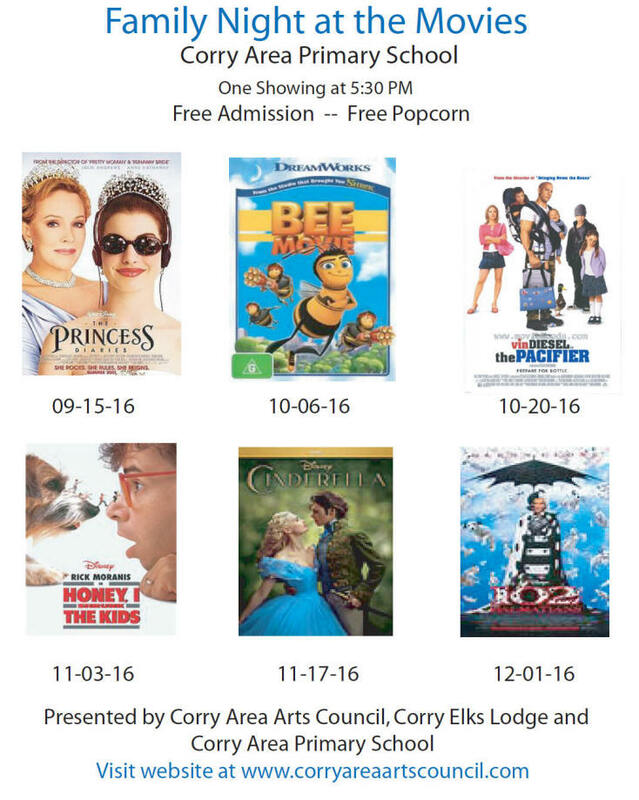 All films are shown on Thursdays and will begin at 5:30 p.m. in the media room at Corry Elementary School. All ages are invited to enjoy the free evening of entertainment. The first of the 8 films will be the 1953 animated fantasy adventure film Peter Pan produced by Walt Disney. In Technicolor, it is based on the play Peter Pan or The Boy Who Wouldn’t Grow Up and was originally released on 02-05-53 by RKO Pictures. This was the final animated Disney feature released by RKO as Walt would soon form his own distribution company, Buena Vista. Fantastic adventures await Wendy and her two brothers when Peter Pan whisks them away to the magical world of Never Land. After following Peter and his sidekick, Tinker Bell past the second star to the right and straight on “til morning”, they explore the island and Peter’s secret hideout with the lost boys and leap into high-flying battles with swashbuckling pirates and the infamous Captain Hook. It was No. l at the Box Office in 1953 and with it’s re-releases in 1958, 1969, 1976, 1982, and 1989 it has now taken in over $87,000,000.00. This version has been digitally mastered with enhanced picture and sound. The film is 76 minutes in length and is rated G for General Audiences. The second in this series of 8 films will be MGM’s 1950 technicolor classic musical, Annie Get Your Gun. Betty Hutton stars as Annie Oakley and Howard Keel portrays Frank Butler in this movie based on the hit Broadway show. Irving Berlin’s beloved score includes Anything You Can Do, I Can Do Better, Doin’ What Comes Naturally, Girl That I Marry, I Got the Son in the Morning, Moonshine Lullaby, My Defenses Are Down, There’s No Business Like Show Business, They Say It’s Wonderful, and You Can’t Get a Man With A Gun. Film was No 3 at the box office in 1950 and at Oscar time was nominated for 4 Academy Awards for Cinematography, Art and Set Decoration, Film Editing and Scoring of a Musical Picture. It won one award for Scoring of a Musical. The third movie in the Family Night at the Movies series for 2014 is MGM’s Long Long Trailer. This comedy is based on a novel written by Clinton Twiss about newlyweds who buy a travel trailer and who spend a year traveling across the United States. It was made into a movie in 1954 as a vehicle for Lucille Ball and Desi Arnaz who were extremely popular because of their hit TV show, I Love Lucy. The honeymoon trip for the young couple soon becomes one disaster after another. They include the bride trying to cook dinner in a moving vehicle, visiting relatives where they destroy a porch and a prize rose bush, and later a cliff hanging ride on a narrow mountainous road where souvineer rocks and canned goods which she has collected are sliding all over the trailer. Movie was a hit and was the biggest MGM comedy ever made as of the year l954. Movie is 96 minutes in length and is rated G for General Audience. The fourth movie in the Family Night at the Movies series for 2014 is MGM’s Two Weeks With Love. This musical is set in the early 1900’s. The Robinson family leaves their home in New York City to spend two weeks’ vacation in the Catskills. While there love strikes both daughters (Jane Powell and Debbie Reynolds) who fall in love with Ricardo Montalban and Carleton Carpenter while their younger brothers (Gary Gray and Tommy Rettig) are more interested in fireworks and mischief. Songs include Aba Daba Honeymoon, Row Row Row Your Boat, By the Light of the Silvery Moon, and My Hero. Movie is G rated and is 92 minutes in length. The fifth of 8 films in the Family Night at the Movies series is Walt Disney’s Top Ten Hit from 1989, Little Mermaid. This is one of the most celebrated animated films of all time and winner of two Academy Awards for Best Original Song, Under the Sea, and Best Scoring of a Musical. Ariel, a fun loving and mischievous mermaid. is off on the adventure of a lifetime with her best friend the adorable Flounder and the reggae-singing Caribbean crab Sebastian at her side. The l6 year old is dissatisfied with life under the sea and curious about the human world. One night as she is watching Prince Eric celebrate his birthday, a storm ensues and the Prince’s ship is destroyed. She saves his life and in doing so falls in love with him. It will take all of her courage and determination to make her dreams come true and save her father’s beloved kingdom from the sneaky sea witch, Ursula. Number six of the 8 films in the Family Night at the Movies series is 1953’s By the Light of the Silvery Moon. with Bill Sherman (Gordon MacRae) as well as son Wesley’s (Billy Gray) wild imagination and tall tales. Songs include Ain’t We Got Fun, Be My Little Baby Bumble Bee, By the Light of the Silvery Moon, If You Were the Only Girl in the World, Just One Girl, and Your Eyes Have Told Me So. The movie is 101 minutes in length and is G rated. Number 7 in the series of 8 Family Nights at the Movies is Walt Disney’s, Follow Me Boys from 1966.
to a steady stream of high-spirited youngsters (including Kurt Russell). Set against lovingly created scenes of the l930’s, this family classic shines with all the warmth of humor of Disney entertainment at its nostalgic best. A little longer than most Disney films, this Technicolor classic is 133 minutes in length and is G rated. The final movie in the Family Nights at the Movies series during this school year is MGM’s remake of the 1940 classic, Shop Around the Corner, In the Good Old Summertime” from 1949. The locale has been changed from Budapest to turn-of-the-century Chicago and music has been added. Van Johnson and Judy Garland portray squabbling store clerks who do not know that they are romantic pen pals. Garland introduces Christmas song – “Merry Christmas” in a score which also features the title song as well as Meet Me Tonight in Dreamland, I Don’t Care, Put Your Arms Around Me, Honey, and Wait ‘Till the Sun Shines Nellie. This Technicolor music comedy is 102 minutes in length and is for General audiences. will begin the 2013-2014 season on September 12, 2013 with the Walt Disney production of Sleeping Beauty. 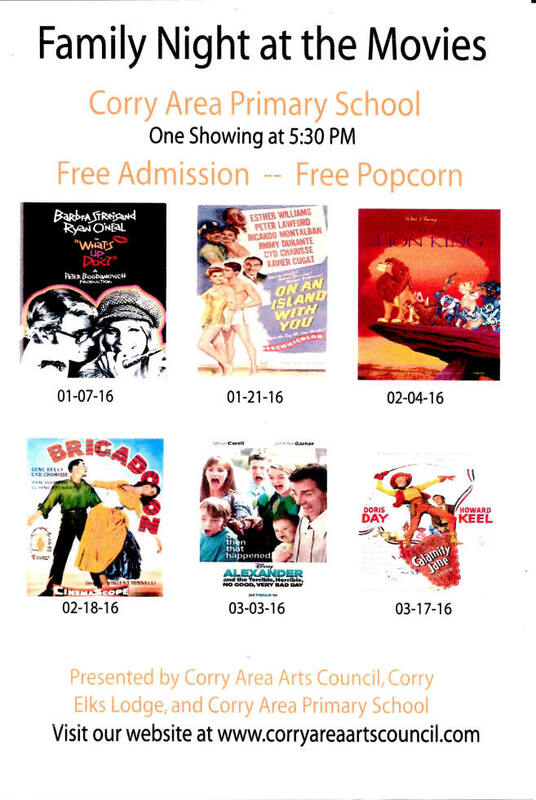 Filmed in 1959 this full length feature will begin at 5:30 p.m. in the Corry Elementary Media Room. Both admission and popcorn are free. Heralded by audiences and critics alike, Sleeping Beauty was the final fairy tale to be produced by Walt Disney himself. Now fully restored with revolutionary digital technology, its dazzling colors, rich backgrounds and Academy Award nominated orchestrations shine brighter than ever. When an enchanted kingdom and the most fair princess in the land fall prey to the ultimate mistress of evil, the fate of the empire rests in the hands of three small fairies and a courageous prince’s magical kiss. Their quest is fraught with peril as the spirited group must battle the evil witch and a fire-breathing dragon if they are to set the Beauty free. From spectacular action to the breathtaking pageantry of the princess and her kingdom, Sleeping Beauty has something to charm every member of your family. Feature is 75 minutes in length and is rated G for General Audiences. Disney’s 1968 production of Blackbeard’s Ghost. Blackbeard. The once-blackhearted scoundrel materializes in a small New England town, cursed to wander in limbo until he performs a good deed. He gets his chance when he decides to help a local college track team coached by Dean Jones whose girlfriend is played by Suzanne Pleshette – the team hasn’t a ghost of a chance of winning! Blackbeard finds himself full of team spirit, and dispenses his own brand of invisible coaching in this warmhearted comedy that will have you laughing from his first fade-in until his final fade-out! This color film is 107 minutes in length and is rated G for General Audiences. The third of the twelve Family Night at the Movies will be Walt Disney’s 1977 classic, Freaky Friday. one another. Each wishes they were in the other’s shoes. When they switch bodies, each is forced to adapt to the other’s way of life for one freaky Friday. As they adjust to these new personalities, they begin to understand each other better. Things happen at a rapid pace and there is never a dull moment. Movie contains one of the most hysterical ski sequences and car-chase episodes ever filmed. The film is 95 minutes long and is rated G for General Audiences. The 4th of Twelve Family Night at the Movies is Warner Brothers “On Moonlight Bay” from 1951. The Winfield family moves into a new home in a small town in Indiana. Tomboy Marjorie (Doris Day) begins a romance with William Sherman (Gordon Mac Crae) who lives across the street. Based on Booth Tarkington’s “Penrod” series, film stars Leon Ames as her banker father, Rosemary Decamp as her homemaker mother, and Billy Gray as her mischievous brother Wesley. Songs performed include “Cuddle Up A Little Closer”, “I’m Forever Blowing Bubbles”, “ It’s A Long Way To Tipperay”, “Love Ya”, “Pack Up Your Troubles, “On Moonlight Bay”, and “Till We Meet Again”. No. 5 of the l2 movies chosen for this school year is the Trouble With Angels released in 1966 by Columbia Pictures. Hayley Mills and June Harding star in this delightful comedy as two high-spirited mischievous students who turn a convent school upside down with their many pranks including setting off fire alarms, smoking in the church basement, and putting bubble bath in the sugar bowls. They keep things hopping for Mother Superior played by Rosalind Russell and her group of nuns. Their graduation is both a relief and a celebration for the entire faculty. 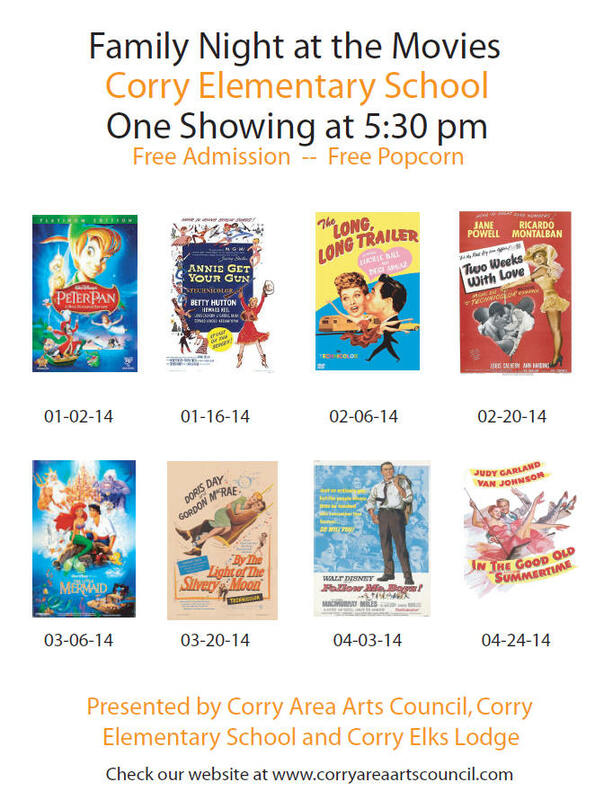 Number 6 of 12 Family Nights at the Movies will feature Glenn Miller Story which was released in 1954. Glen Miller is playing his big band hits American Patrol, Basin Street Blues, In the Mood, Little Brown Jug, Moonlight Serenade, Pennsylvania 6-5000, St Louis Blues March, String of Pearls and Tuxedo Junction in this stunning musical biography. Jimmy Stewart and June Allyson star as Glenn and his wife Helen, charting Miller’s rise from obscurity and poverty to fame and fortune in the early 1940.s. In Technicolor, the film is l hour and 53 minutes in length and is rated G for General Audiences.